Most recently Michael completed the feature larping comedy film, LLOYD THE CONQUEROR which he directed and co-wrote. The film stars Brian Posehn, Harland Williams and Mike (Bubbles) Smith and features an original soundtrack from an all-Canadian line-up of hard rock superstars including 3 Inches of Blood, Bison B.C. and Trigger Effect. Music has always been an important part of all of Michael's film projects. He holds a BA with Honours from York University in Communications Studies and Humanities. His Masters of Arts from The University of North Carolina-Chapel Hill concentrated in documentary film theory and practice and also consisted of working with many local independent and PBS documentary producers and directors. Using the skills he learned from mentoring with these various filmmakers he applied them to his own 52-minute documentary about the first combat active US soldiers to enter WWII, "Robinson's Red Raiders: The Story of the 22nd." As a result of his quality work and stellar grades Michael won an internship in Hollywood, California with legendary director Ridley Scott's development company, Scott Free Productions. Since moving back to Calgary about 7 years ago his body of work includes: a dozen short films, commercials and music videos. His projects have appeared at various national and international film festivals and have won numerous awards. In addition to writing and producing film projects Michael has been expanding his impressive repertoire by directing his first play with Workshop Theatre (Orwell's 1984) and teaching filmmaking at various schools and co-ops. 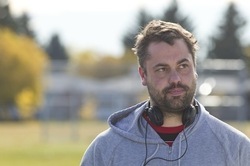 He is also the founder and co-organizer of the annual event, The Calgary Super 8 Filmmakers Challenge, a platform meant to encourage and foster the Alberta filmmaking scene, and now in its 7th year.